Hurrah! Late varieties of oranges mean that citrus season isn’t limited to the 3 or 4 months of winter, as it was when I was a kid growing up in Florida, citrus country. I can now, indeed, enjoy oranges all the year round, even if, I will admit, they are sweeter and more flavorful in some seasons than others. And oranges go so well with spring and summer flavors, and especially berries, such a treat. Oranges are my thing. That’s clear by now. So when the group of blogging friends known as Progressive Eats chooses citrus as their theme of the month, I know that I had better make a bit of time in my high-season schedule (let’s just say that bustling is putting it mildly) to create and share a recipe. And oranges sing to me. When I began my Orange Appeal cookbook adventure, I realized – much to my surprise – that although I grew up eating oranges, one by one and two by two, and still enjoy, nay, can’t get by without an orange after every meal, I really had never cooked with my favorite citrus, nor had my parents. Yes, I’ve added orange juice and zest to cake and cookie batter; nothing is better than orange and chocolate so hello marble cake, marbled madeleines, and orange-kissed brownies, ganache, and layer cake! But orange hadn’t otherwise ever been used as an ingredient. I researched and researched, and trialed and tested, and little by little understood the magic of an orange, the versatility and the unexpected, astonishing metamorphoses of flavor due simply to the addition of orange. So what to do for this challenge? High season means that I have little time and even less energy to concoct something new and complex for a challenge. But I didn’t want to share a recipe straight from the pages of Orange Appeal. So I came up with something new, a twist on 2 different recipes in the cookbook, the Moroccan-Spiced Orange Slices in Orange Blossom Water and the Orange Marmalade Whipped Cream that I created to top the Rye Spice Cake with Orange Syrup. In kicking up a couple of recipes, in starting with existing recipes and playing with flavors and style, I hope to show not only how versatile the orange is, but how easy it is to begin with the orange as a blank slate and create something delicious and new, even astonishing. The weather has turned in Chinon this week, from on-again-off-again rain and cold to summer. The terrace is set and the parasols open, cold beers and chilled white wine flow as Mitzi darts between chairs and legs. The peonies are in full bloom, the rose bushes are richly laden with buds, and Chinon is overflowing with gorgeous tumbles of wisteria. Summer has arrived and with it the first of the hotel’s bikers and walkers and the market’s first strawberries and blueberries. And now we crave treats that are cooling and lighter than those heavier baked goods we relished and took comfort in during the colder, greyer weather. And this orange salad is it. This special treat seems simple on the surface. But a couple of secret ingredients turn a light and refreshing fruit plate into a spectacular dessert. Don’t hold back on the cream. Progressive Eats is the monthly food and drink extravaganza where friends share a virtual event much like the Progressive Dinners of old when participants would go from home to home to enjoy a different course at each location. With Progressive Eats, a theme is chosen each month, members share recipes suitable for a delicious meal or party, and you can hop from blog to blog to check them out. Each recipe in our menu this month features citrus in some form and is hosted by Laura from Mother Would Know. A light and refreshing dessert, this fruit salad pairs late season oranges with strawberries and blueberries and the whole is served with a rich, flavorful whipped cream. Grand Marnier, cinnamon and powdered sugar add an unexpected warmth, elegance, and savor to the fruit, and orange marmalade, more jelly than rind, turns this dense cream into the highlight of a not-so-ordinary dessert. Have ready a large serving platter that will hold any liquid and juice under the oranges. Cut off the top and bottom from the first orange, at least ½ inch in, leaving a clear round of orange fruit visible. Reserve these orange ends. Cut away all of the orange rind, pith, and outer membrane from the orange. Turn the orange on its side, the center "core" parallel to the work surface, and slice the orange into 5 equal slices; each should be about a scant ½-inch thick. Poke out any white, spongy center and discard. Repeat with the remaining oranges. Fan the orange slices in concentric, overlapping circles on the serving platter. Squeeze any juice remaining in the small orange rind ends over the fruit. Drizzle the Grand Marnier evenly over the orange slices. Place the powdered sugar and the cinnamon in a small, fine mesh sieve and dust evenly over the orange slices. Allow the oranges to macerate for at least ½ hour but this can be prepared before the meal and refrigerated. Place the heavy whipping cream in a medium-sized chilled bowl. Beat at high speed until thick and peaks hold when the beaters are lifted. Beat in the mascarpone and 1 tablespoon powdered sugar. Beat in 4 tablespoons orange marmalade. Taste and beat in more sugar or marmalade to taste; additional marmalade will add both sweetness and orange flavor so you might not want to add more sugar until you have added as much marmalade as you like. 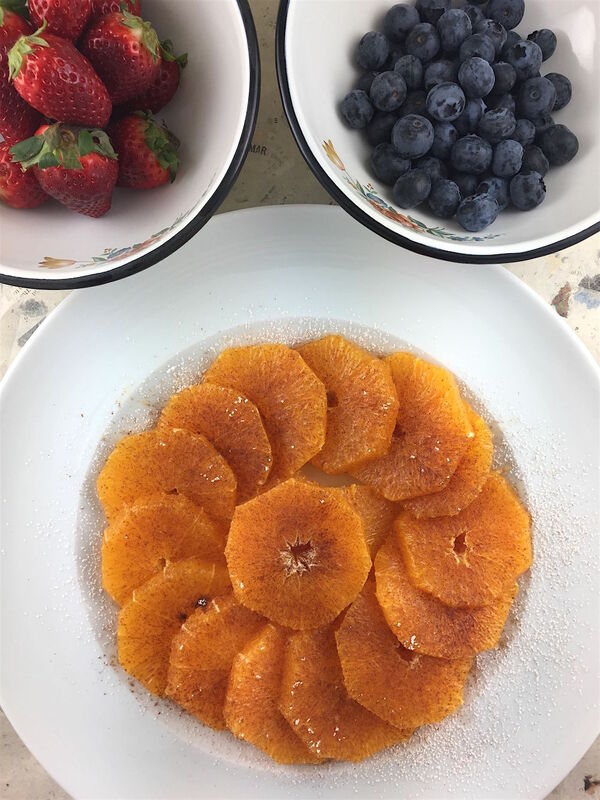 Distribute strawberry halves and blueberries over the orange slices; save some to pass around separately at the table so guests can add as many as they desire. Either add a large dollop of the orange marmalade whipped cream to plated individual servings or allow guests to serve themselves both the salad and the cream passed separately. Note: I use large, sweet, juicy naval oranges but go ahead and use juice oranges, only add 1 or 2 if they are smaller. For a prettier and more interesting dessert, use a combination of orange navels, pink Cara Cara, and even red blood oranges, if you can! Once served, generously grate some dark chocolate over the top of the salad or individual servings and even add a dusting of chopped pistachios or hazelnuts, if you want the crunch. It’s SO fun to have you back with us this month, Jamie! Your salad looks spectacular. I’ve been finding some amazing oranges in the market lately, and it must be a sign that this must go on our menu ASAP! 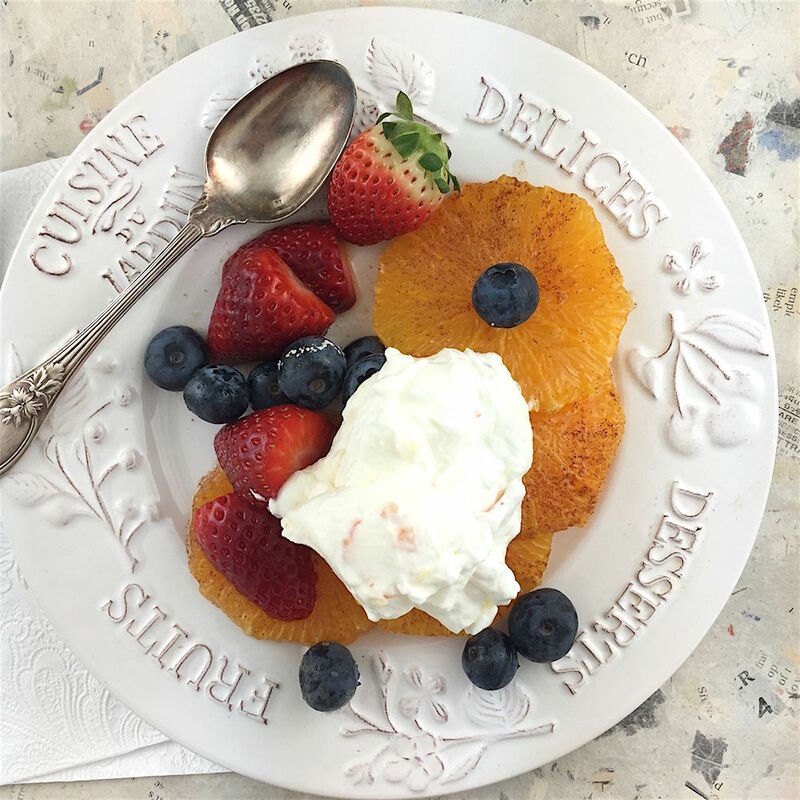 You’ll love this recipe (or the Moroccan-spiced orange slices in Orange Appeal) – the fruit with the touch of Grand Marnier and cinnamon is already so delicious but the whipped cream! My husband and sister-in-law finished the bowl that I had made – directly from the bowl! I loved cooking along this month! Absolutely delicious and stunning! What a fantastic way to end the meal. There is something sublime about simply made desserts – the flavors, the freshness .. everything is perfect. Ansh, you are so right. And what I love about making simple desserts is when you add a surprise factor that people don’t expect they love the dessert even more! What a spectacular dessert! I love the simplicity of the ingredients and how you combined them. The orange and dairy combination always makes me think of creamsicles, even though in this case the result is infinitely more sophisticated. I hope you enjoyed making this as much as I enjoyed reading your post. I’m definitely putting this in the dessert rotation. Oranges are so good, aren’t they? When we lived in Florida we had an orange tree — nothing better than OJ that was squeezed just minutes before drinking. Anyway, this looks lovely — just loaded with flavor. Thanks! Your story of summer makes me a tad bit envious and while I love the sounds of the entire dish; right now I just want to sit with a bowl of that marmalade whipped cream and a spoon. I have daffodils and snow; that requires comfort food! I’m so glad you joined us again this month; it was perfect! So beautiful and the perfect ending to our virtual meal together. It brings back wonderful memories of our visit with you and discovering the magic of Chinon!! That salad looks so refreshing! We have a tree full of tangelos that would lend themselves so well to this dessert, and the strawberry stands are everywhere! Can’t wait. This looks wonderful, Jamie! I’m planning a large-ish dinner party of uber healthy people for June, and this is the PERFECT dessert for me to serve. The Grand Marnier and clever, festive topping makes it a great dessert for a special occasion. And of course, I’ll need to make it a few times, just to make sure I make it right. This is definitely my kind of dessert! I love how you put such beautiful ingredients together and made them all shine. So lovely and so perfect all spring and summer long. Look forward to getting to know you through our progressive dinner parties! This is a lovely way to show versatility of ingredients Jamie. I adore citrus of all kinds. My daughter says: “everything tastes better with lemon”. I feel the same about oranges. Glad you were able to join this month and it was great to see you in New York. Beth, I really wanted more time to talk to you in New York and wish we could have. I’m so happy to have joined the group this year and everyone’s citrusy dish was mouthwatering and a must-make! I love all citrus and lemons and oranges are always on hand for cooking and baking! I have never been able to figure out how people get orange slices like that — thank you for describing the process! This dessert looks delicious. It’s pretty easy once you practice. 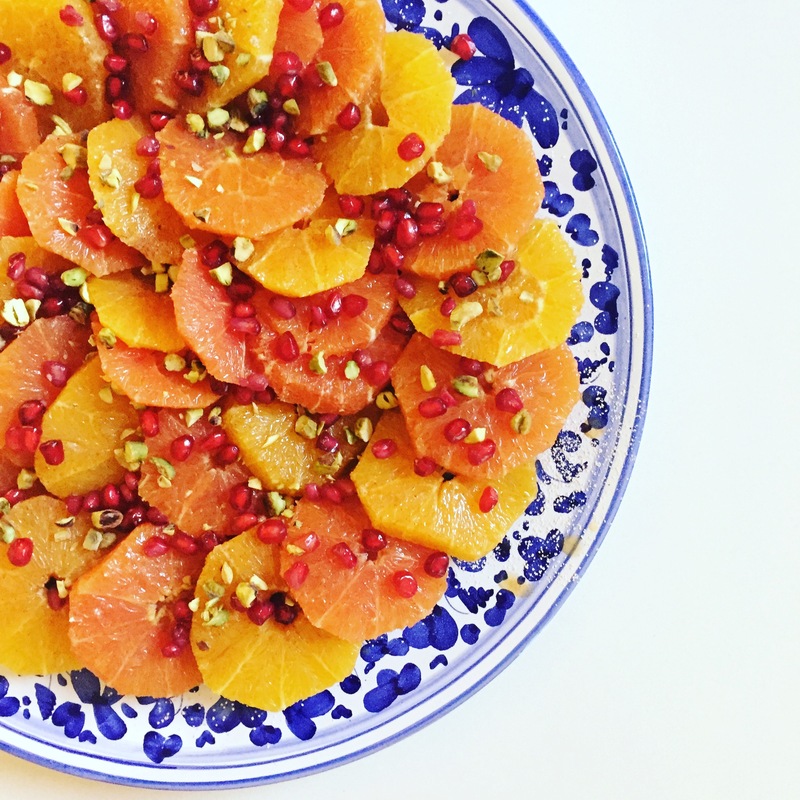 And orange slices are perfect in so many sweet and savory salads and do impress! And just the addition of orange flower water, Grand Marnier, a bit of amber rum, or a drizzle of pomegranate syrup topped with other fruit, chopped nuts, and served with some kind of topping or ice cream and you’ve got a wonderful dessert! I just wanted to drop by and say that this recipe is awesome. I tried it yesterday and everyone at home loved it. In fact we ran out which has never happened before. Thank you so much for this recipe. Amy, this truly makes me so very happy! I am thrilled you made it to such success! Thank you so much for coming by to let me know!